Mistletoe Kisses is on sale for $0.99 until November 30th! A new collection from some of your favorite inspirational authors! Mistletoe Kisses is another Inspy Kisses collection to fall in love with! Once again, a wonderful group of inspirational authors has shared their talents in a great anthology. I enjoyed each of the eight novellas and their shared theme of kisses under the mistletoe! Janet Tronstad delighted me with her fun, retro romance. Lisa Mondello and Lenora Worth warmed my heart with their contemporary romances. Margaret Daley kept me guessing with her exciting, romantic suspense. Pamela Tracy and Camille Elliot swept me back in time with their engaging historicals. Lacy Williams stole my heart with her cowboy romance, and Cheryl Wyatt encouraged me with her story of love and forgiveness. 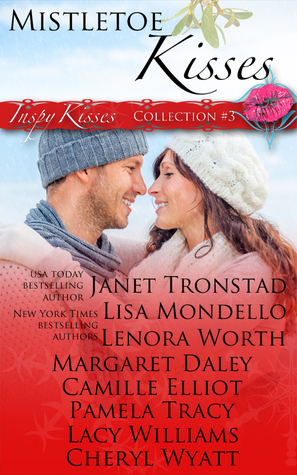 I loved Mistletoe Kisses and look forward to reading more Inspy Kisses collections! Don’t miss these delightful, inspirational stories! I received a complimentary copy of this collection from the authors. All thoughts expressed are my own and no monetary compensation was received.